Moving into a new home following a separation or divorce sometimes happens more quickly than you plan or anticipate. When choosing a new place, you carefully weigh a lot of factors, including price, size, location, distance to your workplace, distance to the children’s school, and distance to the children’s other parent. Unfortunately, once a place is chosen, the monumental task of moving is complete, and the children get acclimated, there is often one more piece of planning that many people overlook. That is fire safety. October 8-14 is National Fire Prevention Week. In recognition, we would like to present some facts and suggestions for fire prevention and safety planning. According to the Fire Marshall of Raleigh, it only takes 30 seconds for a small flame to get out of control and minutes for your home to fill with smoke and become engulfed in fire. In contrast, most people believe they have at least six minutes to leave the house. Further, we cannot overstate the importance of having working smoke detectors: three out of five fire-related deaths at home occur when there are no detectors or the detectors are not functioning. It is therefore important practice the following fire safety advice. 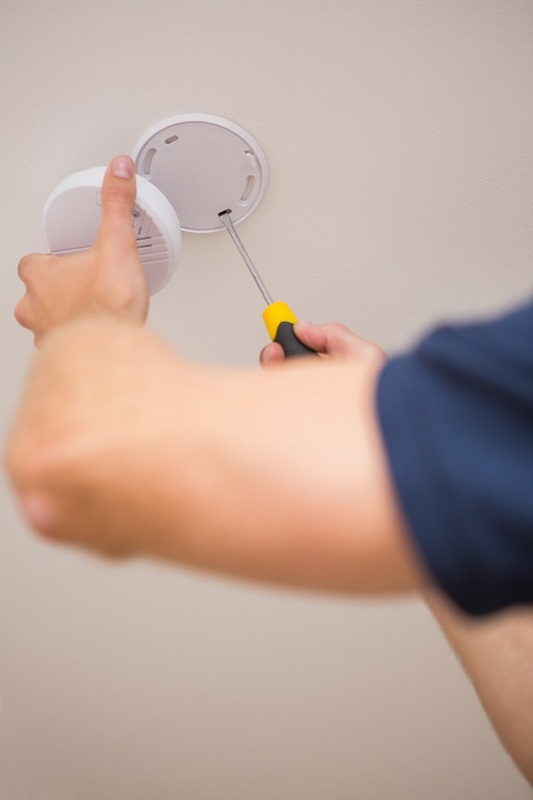 Install smoke alarms in every room of your house. Choose a hardwired system if possible. If there are already detectors installed, check the expiration date of the detectors. That’s right, smoke alarms have expiration dates. Regularly test the alarms by pressing the button on the face of the detector and check the batteries. A chirping noise from your detector indicates that it is time to change batteries, not an opportunity to take down the detector so it stops annoying you. Purchase fire extinguishers and make them easily accessible to the kitchen and bedrooms. Further, note their expiration dates. If you have a second floor, or live on a second floor, purchase a retractable fire ladder that can attach to your second level window and allow you to escape in a scenario where the stairs are inaccessible. Create exit plans with your family to prepare for a fire. The plan should involve moving fast toward designated exits. Remember, it only takes 30 seconds for a flame to get out of control and minutes to engulf a home. Further, as many fires happen at night while people sleep, it is important to get your children and get out of the house as soon as you hear smoke detectors activate. If you live in a multi-level apartment or condominium, look for all fire exits and staircases for your building, as well as any fire exit plan. If none is posted, speak to your apartment manager for the plan. Visit your local fire station. It never hurts to drop by your fire station to introduce yourself and say thank you. Further, most Fire Departments have some form of fire safety education available by appointment. Teach your children about fire safety, such as how and where fires typically start, and preventative measures they can take to keep you and your children safe. Contact New Direction Family Law if you need legal advice or representation regarding any family law matter. We handle separations, divorces, child custody, child support, alimony, and protective orders. Our attorneys have twenty years of combined legal experience in providing effective, smart legal representation and helping clients reach resolutions so they can move forward. Call New Direction Family Law at (919) 719-3470 to schedule a consultation, or visit our website.